A rare original architectural working drawing on blue linen by the great British architect-designer, Charles Francis Annesley Voysey, (1857-1941). This is an executed design, part of working drawings for the construction of a Miners Welfare Institute in Yorkshire. 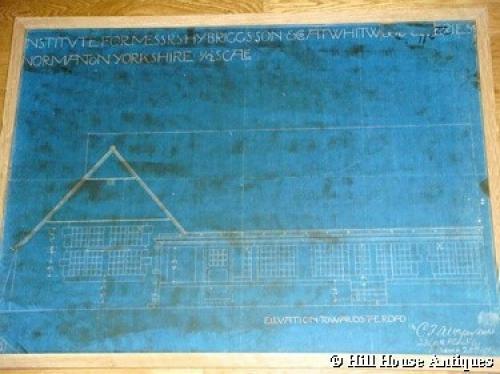 Architectural plans (1/2 inch scale) for extant institute building for Messrs. Hy Briggs Son & Co. at Whitwood Collieries, Normanton Yorkshire (signed and dated byCFA Voysey in April 1905 lower right). Plans show roadside elevation of the miners’ welfare institute (now the Rising Sun public house – a Voysey themed pub) featuring characteristic buttressed gable. Working plans are executed on blue linen and framed in oak. Approx 29” w by 23” high excluding frame.